This is the moment I've been terrified of - letting you actually see larger portions of my house! Today is the day, though, and I'm feeling quite chuffed because I've finally finished decorating my mantlepiece. Rachel's Mom (garage saler extraordinaire) had a garage sale on the weekend and she was getting rid of a lot of milk glass. I thought it would look nice against my grey walls and I think it works, don't you? I'm also happy with the stacked wood in the fireplace. It works as a great kid-proofing! The colour on the walls is Sherwin Williams Gauntlet Grey. The magazine rack is still only primed because I haven't decided what colour to paint it (orange? pink? What you do you think?). And here's a before shot when we looked at the house. Obviously, this isn't our furniture or decor! 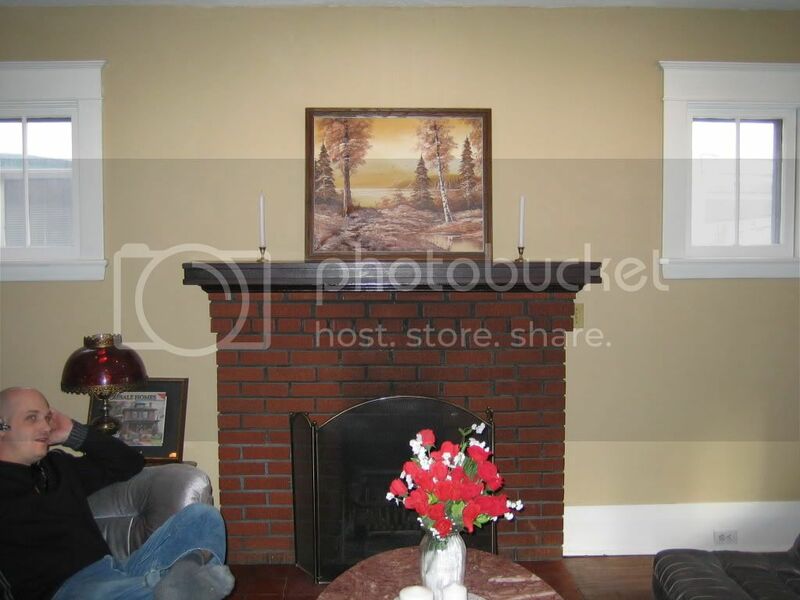 The whole place was painted that beige and the guy in the pic is our realtor. Thanks! It's still a work in progress somewhat, but I'm happy with how it's going! May I ask where you got your firewood from? How long did you keep it in there? I want to do the same to my fireplace (to keep my cat out), but I've read I should be worried about creepy critters. True or false? Your house looks beautiful, by the way. Thanks! Thank you! I bought my firewood from a guy on Craigslist. I just drove out to the country and picked it up, though you could probably get it in town somehow. It is still happily in my fireplace and is totally fine in the critter department, or at least no worse than the fireplace/chimney. Nothing is living in there (I hope! )!